All the desirous job seekers are advised to go online to apply for Haryana Roadways Recruitment 2019. Department of Transport, Haryana is going to recruit new applicants for the vacancies of Roadways Bus Driver and Conductor in the upcoming days. There are a number of seats available for these posts and the deadline to apply for this opportunity is updated shortly. This recruitment process is all going to be undertaken by the State Transport Department and is authenticated through the official web portal of Haryana Staff Selection Commission. For the eligible qualifiers, the registrations are to be carried out through the internet media and are expected to begin in a very short amount of time from now. Kindly, go through all the informative details and proceed to apply for Haryana Roadways Driver Conductor Recruitment 2019 as instructed in the following segments. This update is here alongside the related information that is helpful to the candidates willing to apply for the available posts. That said, the online registration procedure is carried out through Haryana SSC official website. Please find the relevant updates given in the subsequent segments of this article and proceed to submit your duly-filled applications. The final date to register online soon. 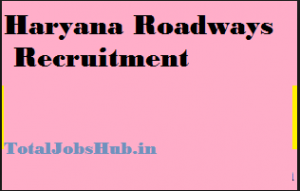 Further information has been disclosed about Haryana Roadways Recruitment 2019 here. Kindly, access all the related information arranged in the following news sections before applying online. The details cover job-related information such as eligibility criteria, educational qualification, age limit, application fee, and salary band as defined by the state government. A candidate must be from a local region of the state and should be familiar with Hindi and Punjabi languages. Applicants must have qualified class 10th Examinations from the state education board or equivalent. Hopefuls should be having a Heavy Motor Vehicle Driving License and must have done High School education from the state school education board or equivalent. The lower age limit to apply is 18 years and the maximum age to apply for the jobs is 42 years. Imp: Age relaxation is to be given to the reversed categories is as per the State government rules. For the candidates belonging to the General category, the fee chargeable is Rs. 100/-. For the aspirants from reserved categories, it is Rs. 25/-. A written test shall be held for the registered contestants which is further to be followed by an interview, document verification, and Skill Test (For Driving Posts Only). After the placement to the respective depot, the appointees shall be paid with Rs. 5500/- to Rs. 20200/- along with the Grade pay of Rs. 2400/-. After landing on the homepage of the target portal, locate the recruitment section and find a recently Haryana Roadways Recruitment 2019 notice. Download it to read carefully and fill all your particulars as instructed. Pay the requisite fee amount and upload soft copies of your passport-sized photograph and signature. After fulfilling the formalities, check for the error, if any. Finally, submit the application and generate its hard copy to keep it for future references. Get to the final segment of this page and reach the correct place to apply for these vacant positions. Find out more details about Haryana Roadways Recruitment 2019 Driver Conductor or sarkari naukri in haryana roadways from this authenticated link. For the latest news regarding the upcoming jobs and opportunities, please keep visiting this page and leave your remarks in the comments box provided hereunder.